Is It All Greek To You? Thank Medieval Monks, And The Bard, For The Phrase Ben Zimmer, language columnist at The Wall Street Journal, explains the origin of the phrase "it's all Greek to me" — and shares a few variants from other languages. 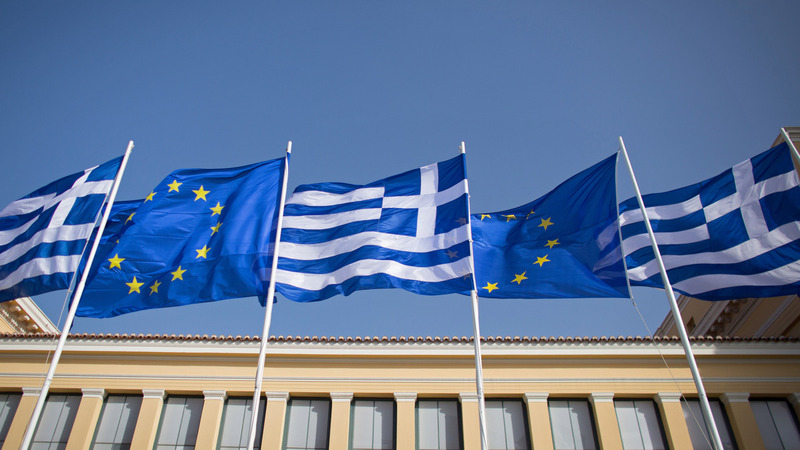 Greek flags fly beside those of the European Union in Athens. Many people chalk the phrase up to Shakespeare, but its origins likely date back much earlier than that -- to medieval monks eager for a cop-out. If you've been following the Greek financial crisis, you've certainly seen this old cliche in the headlines. In USA Today, there was "If 'it's all Greek to you,' here's the skinny on debt crisis." The BBC says, "All Greek to you? Greece's debt jargon explained." We're all guilty of it. Even NPR had "If the mess in Greece is all Greek to you, then read this." Shakespeare lovers are well aware this phrase comes from the Bard — or, well, partly. Ben Zimmer, a language columnist for the Wall Street Journal, says that Shakespeare is probably responsible for the popularity of the phrase. "It appears in his play Julius Caesar," he says. "There's a character who's describing the speech of Cicero, who is a learned scholar; he actually knew Greek. But this character didn't really understand what Cicero was saying, and he says, 'For mine own part, it was Greek to me.' "
But Shakespeare didn't actually come up with the phrase "it's all Greek to me." The phrase appeared in a translation of an Italian play decades earlier. Its true origin is a bit of a mystery, though Zimmer says there's a pretty good guess. Back in the days before the printing press, medieval monks would copy old Latin manuscripts to preserve them, but the Greek alphabet threw them for a loop. "And so if they were copying a Latin manuscript, and they came across a Greek quotation in a manuscript, they might have trouble actually trying to copy that part," Zimmer says. "And so as a kind of a cop-out, they might just write in Latin, Graecum est, non legitur, which means, 'This is Greek. It cannot be read.' "
But it seems like those medieval monks — or whoever's behind "it's all Greek to me" — were just expressing a universal human sentiment. Zimmer says there's a version of this phrase in many languages. "In Finnish, you might say, 'It's all Hebrew,' " he says. "In Italian, you might say, 'This is Arabic,' or 'This is Aramaic to me.' "
And in Greek? The expression is, "This is all Chinese to me."